Pig’s Ear was a family folk group that entertained audiences in the Kent/Sussex/Surrey area from the late 1980s to 2011. The group was formed in 1987 by husband and wife Grant and Sue Rule, and Grant’s brother, Keith. From 1999, Pig’s Ear became a four-piece when Grant and Sue’s daughter Lyndsey joined the band. The group ceased to perform following Grant’s untimely death in 2011. Whilst mainly “traditional” in style and approach, Pig’s Ear sang just about anything that they felt they and their audiences would enjoy, including a number of self-penned songs in the traditional style. Their aim was always to leave their audiences with a song on their lips and a smile on their face. The name, Pig’s Ear, was chosen because Grant and Sue had previously been part of a folk group called Hamfisted. A relentless series of pig-related jokes ensued, particularly in the titles of the 5 CDs the group recorded. 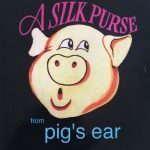 The porcine tradition continues with Silk Purse, the duo formed by former Pig’s Ear members Sue and Lyndsey Rule. Some Pig’s Ear CDs are still available – contact Sue sue.rule@grantrule.org to check current stock. Pig’s Ear’s CDs were all produced by the group on their own PIG label; proceeds from any sales now go to the Grant Rule Trust. Post & Packing costs £1.50 for the 1st CD, plus 50p for each additional CD. Prices in GBP. Please make cheques payable to The Grant Rule Trust and send to: Sue Rule, Rosehaugh, Shore Road, Blairmore, Dunoon PA23 8TE. Don’t forget to include your address! Grant had partially compiled a book of the music and lyrics of songs by Keith and Sue, as well as a couple of his own. The Grant Rule Trust is hoping to complete and publish this book in due course. 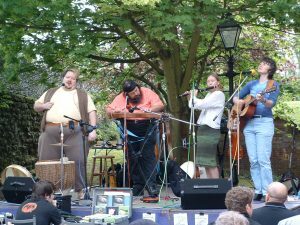 Pig’s Ear started to play at folk clubs within striking distance of their Edenbridge/ Tonbridge base in 1988, and over the group’s 23-year career, they became established favourites at many local venues. The original focus of the group was a-capella harmony, inspired by groups such as Threadbare Consort, Swan Arcade and the Songwainers. From the start however, the repertoire included arrangements featuring instrumental accompaniment of guitar, Appalachian dulcimer and bodhran and over time the instrumentation grew to include bouzouki, mandola, fiddle, whistle, recorders, flute, oboe, Northumbrian smallpipes, concertina and a range of percussion. However, strong unaccompanied harmony singing remained a hallmark of the “Pig’s Ear Sound” and song, lyrics and story-telling were always at the heart of their music. Pig’s Ear ran a stage at the Rochester Sweeps Festival for many years, gaining a number of new fans each year. They also appeared at Broadstairs, Tenterden, Croydon, Gosport, and Crawley festivals as well as many folk clubs, pubs, fetes and community events in the south-east of England. During the 1990s, they ran regular monthly sessions at the New Drum pub in Tonbridge. In later years, they organised live music for Kent Wildlife Trust’s ‘Festival of Wildlife’ at Sevenoaks. Pig’s Ear started and provided seed funding for a small annual music festival, the Pig’s Ear Folk Ale, which continues to thrive under a voluntary organisation committee. Details of the next festival can be found at www.folkale.co.uk. The last Pig’s Ear performance was a one-0ff show called “The Song That Is Forever Sung”, performed at the Plaza Suite in the Stag Theatre Sevenoaks on 16th October 2011. The show was devised by Sue Rule based on her “Shaihen Heritage” trilogy of fantasy novels and consisted of a series of readings from the books, interspersed with songs, many learned especially for the show – including an arrangement of ‘Thousands or More’ which closed the show and was therefore the last song Pig’s Ear sang. Unfortunately, no recording was made of the evening. 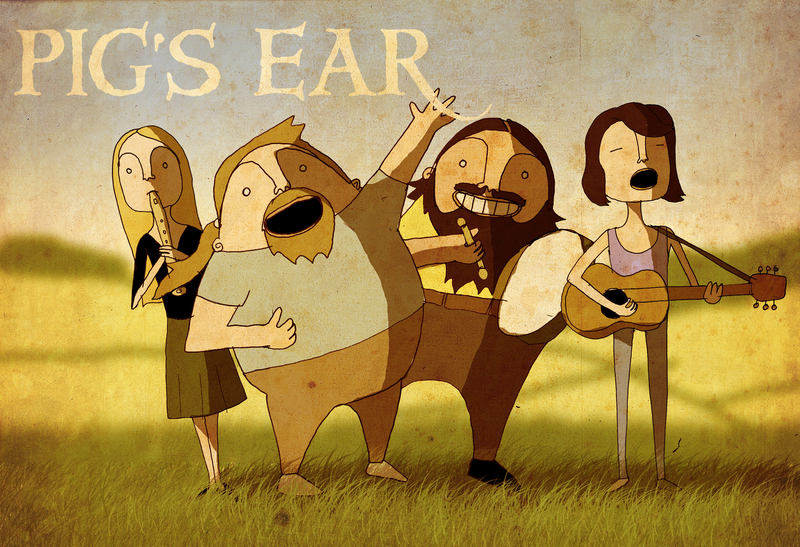 Pig’s Ear sang for the love of singing, and it showed. Whether featuring one lead voice, all together in harmony, accompanied or unaccompanied and whether the song was traditional, contemporary, or out of the home sty, Pig’s Ear made music that was varied, often thoughtful and always entertaining. Following Grant’s death, the remaining members of Pig’s Ear founded a loose collective of local folk musicians, Free Range Folk, who continued to provide music for various charitable and community events in and around West Kent. Keith and Sue occasionally played together until Keith’s death in March 2017. Lyndsey went on to do a Music Masters degree at Newcastle University looking at the links between folk music and landscape. In Newcastle, she teamed up with Beth Rawlins and Anna Gillings to form the acclaimed by sadly short-lived group House of Lost Souls. Lyndsey and Sue still perform as a duo, Silk Purse, and both are available as solo performers. Lyndsey is also available for workshops and music tuition – contact lyndsey.rule@gmail.com. Sue has also recorded a CD with James Kerry, “On Kentish Horseback” – copies available from sue.rule@grantrule.org. Sue and James played briefly as a duo, Stringbellows, until Sue moved to Scotland in 2017. Sue has recently joined the Cowal Fiddle Workshop.